This year the French business family Peugeot has been in the transport game for a staggering 177 years. For the first 50 years and more it was producing bicycles. Indeed its inspirational founder Armand Peugeot wowed the fashionable French public with his own version of the pennyfarthing during the 1880s. Long one of the most famous names in the European car industry, it still sees the chequered flag first at some of the world’s most demanding rallies. Peugeot is now part of Groupe PSA, a French multinational that links together great names of the industry’s past, including Peugeot, Citroen, Opel and Vauxhall, Spanish car parts producer Faurecia, and Banque PSA which provides finance to its customers. It is an understatement to say the European motor business has been through the wars. Seven years ago it was in terrible shape. Sales collapsed; there was serious over-capacity and it was left to the ever-reliable French government to appear in the heat of battle, tricolour unfurled, marching over the sand dunes bearing state rescue funds worth €7bn. This of course was bending EU rules but then the French are a class act in rule bending and in justifying government aid to needy “strategic industries”. 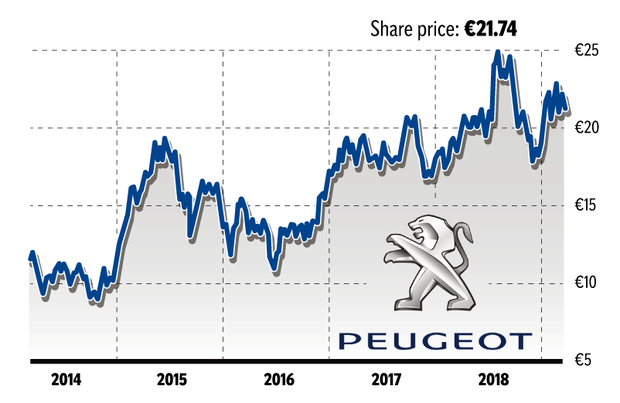 When the financial engineering was finished the French government and PSA’s Chinese joint venture partner had 13pc of the shares each, the Peugeot family 14pc. Five years ago PSA appointed the Portuguese-born, French-educated Carlos Tavares as chief executive. He had been chief operations officer under the now beleaguered Carlos Ghosn at Renault. Tavares has been a lucky general; the European car market improved and sales have increased for five years in a row. Two years ago the company was confident enough to buy General Motors’ European operation. Tavares has surprised the market by announcing the company wanted to reduce its overdependence on Europe and would re-enter the tough US market it exited 28 years ago. It also plans to launch Citroen in India and Opel in Russia. Its US roll-out would supply cars from existing plants in Europe and China. That may take some time as President Donald Trump is targeting European manufacturers and the Chinese tariff problem still rolls on. PSA Groupe is now the second largest producer in Europe after Volkswagen. Sales last year reached a record 3.9 million. Its market share of 17pc is underpinned by strong positions in France, Spain, Italy and Germany. However investors have concerns relating to PSA’s 44pc fall in sales in China, a market which accounts for almost a third of global sales. The steep fall is due to local brands moving into the mid-range market, squeezing prices. A turnaround will not be easy as the Chinese market is in decline, and moving towards electric cars. Last year group revenues jumped an impressive one-fifth over the previous year to €74bn. Net profit for the year also rose to €2.8bn helped by Opel/Vauxhall, who surprisingly returned an operating profit for the first time in 20 years. Profit margins at 6pc are thin by other industries’ standards but regarded as a triumph by car manufacturers. Free cash flow is positive at €3.5bn. PSA trades at €22 a share, up almost a third on its yearly low but still way off the €53 of more than a decade ago. Investors in the company are concerned as to the high cost of entry into the coming electric car era. Mid-sized groups like PSA will have to combine forces with other equivalent producers to remain relevant; Renault/Nissan or Fiat/Chrysler would be likely candidates. They will need to pool their resources and be adaptable to compete with VW and Toyota. With a low price earnings multiple of six and multitude of challenges facing PSA, one should be cautious. Previous articleCode Red: Is AOC the new face of US politics or a step too far to the left?